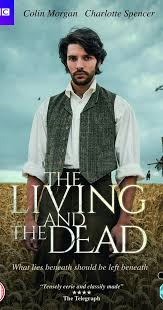 The Living and the Dead (BBCAmerica) Rated TV-14 | What to Watch. A young couple inherits a farm, but supernatural forces seem to be at work against them. Starring Colin Morgan, Charlotte Spencer, Malcolm Storry, Kerrie Hayes, Nicholas Woodeson. At first, I wasn’t sure what kind of show this was trying to be: a supernatural mystery or a man plagued by his past. It hasn’t exactly resolved itself yet, but it is really quite compelling anyway. The stories are interesting, and the show is fun to watch. I am curious to see how the man discovers what is really going on. This show is worth a watch. This entry was posted in 2016, BBCAmerica, British Films, Drama, horror, Rated TV-14, reviews, Thrillers, Tv shows and tagged BBCAmerica, Charlotte Spencer, Colin Morgan, couple, farm, forces, inherits, interesting, Kerrie Hayes, Malcolm Storry, man, Nicholas Woodeson, past, resolve, show, stories, supernatural, The Living and the Dead, trailer, TV series, Tv shows, work, worth, young. Bookmark the permalink. Pingback: New This Week on DVD, November 15, 2016 | What to Watch.